Dubai, UAE, April 2, 2018: Once again the Rallye Aïcha des Gazelles, an event dedicated to the true spirit of woman, which is able to rise to the many challenges in life with dignity and courage, was held with contestants competing with each other to outlast the challenge of the terrain and elements with great panache! The Rallye is unique, in that there is no selection other than the competitors' own determination – on who can take part regardless of age, class, nationality or experience –, the participants of this rally take the wheel of a 4x4, crossover, quad, truck, motorcycle, or other type of vehicle. The competition does not involve speed, and it respects the local populations and the environment. At the end of the event, all the amateur and professional Rally participants, who are called 'Gazelles', leave with an indelible memory: that of surpassing one's own limits and going in search of oneself, far from a woman's potentially difficult daily life; but also that of sharing and mutual aid with one's partners and the other 'Gazelles'. SAINT HONORÉ has been supporting the Aïcha des Gazelles Rally since 2013, and this time two crews represented the brand at the flag off in Nice. The first team comprised Kiera Chaplin, SAINT HONORE's new face, grand daughter of Charlie Chaplin, and Jazmin Grace Grimaldi, daughter of Prince Albert II of Monaco. The pair sported the watchmaker's colours in the electric vehicle category. This category was flagged off by Princess Stephanie of Monaco. The second team of Carole Montillet-Carles, skier and Olympic champion (15th participation) and Sylvie Godeau Gellie (6th participation) participated in the 4x4 'Expert' category. In honour of the 38th Rallye Aicha des Gazelles, SAINT HONORE has issued a new Opera Coeur de Gazelles. This new watch is characterised by a bracelet with the same colour as the participants' vests and by a steel dial featuring a gazelle in the background adorned with the 'Eclair' effect. 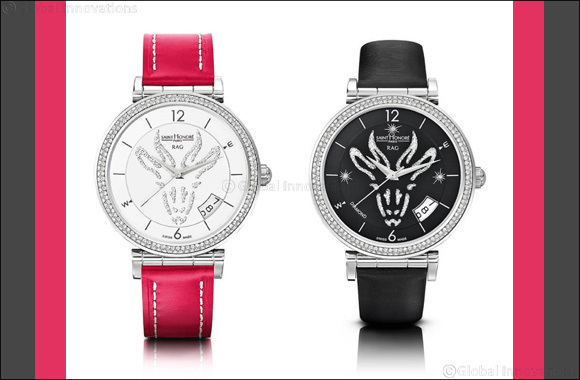 For each watch sold, 100 € will be donated to the association 'Cœur de Gazelles'. Cœur de Gazelles works in collaboration with the Moroccan government for the benefit of the local population. A medical caravan of 56 people perform paediatric, gynaecological, general medical, hygienic, ophthalmological or dental acts for the underprivileged. Saint Honoré is committed to this 100% female rally, since it corresponds with the brand's essential values: surpassing one's own limits, sharing, team spirit and, of course, elegance!